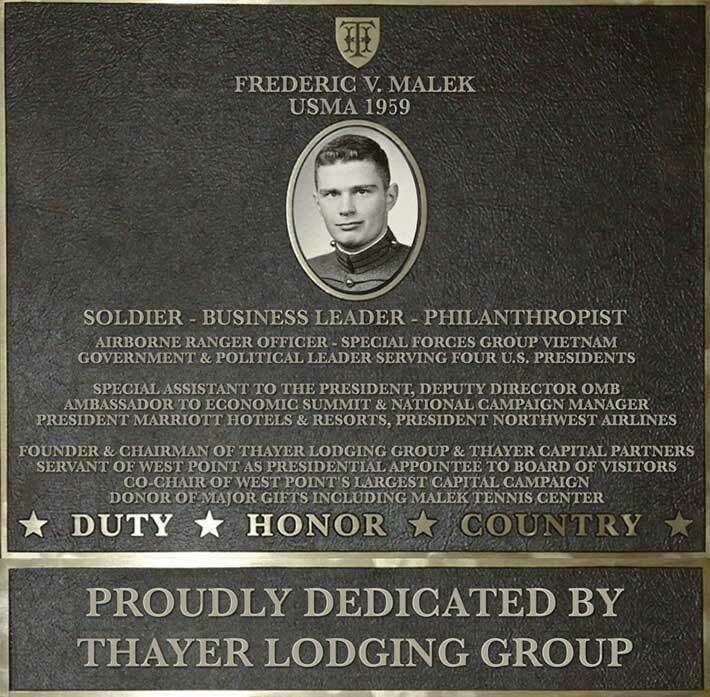 Fred Malek is a successful businessman, political figure and philanthropist. He is one of America’s most influential leaders in both American business and politics. Fred has led some of the world’s largest corporations (Marriott and Northwest Airlines) and has advised four US Presidents, all after starting his career as an Army officer in combat. Throughout his life he has always given incredibly of his time and efforts to support West Point. Despite his incredible success Fred remains a humble man. He grew up and was raised by his mother and father in a middle class area of Chicago, graduating from Morton High School in Cicero, Illinois. He attended West Point in 1955 and graduated in 1959 with a commission in the Infantry. He graduated from Airborne and Ranger Schools and served with a Special Forces Group (Green Beret) in Vietnam in 1961. After completing his military commitment Fred attended Harvard Business School and received his Master’s in Business Administration. He was a consultant at McKinsey & Company and then served as Chairman of Triangle Corporation before returning to government from 1969-1974. He entered government as Deputy Undersecretary of the Department of Health, Education and Welfare. He later became Special Assistant to the President of the United States, and Deputy Director of the U.S. Office of Management and Budget under Presidents Nixon and Ford. He left government and became Vice President and rose to become President and CEO of Marriott Hotels. During his eight-year tenure as president of Marriott Hotels profits quintupled and the stock increased eight fold. He then became President and CEO of Northwest Airlines, and Co-Chairman of CB Richard Ellis. In addition to being a corporate executive, Fred became a major investment financier. In his earliest investment activities Fred led the acquisition of the Ritz Carlton Hotel Company with Marriott International as a major equity partner, was one of three leaders in the acquisition of Northwest Airlines, led the acquisition of CB Richard Ellis (formerly Coldwell Banker), and was a partner with former President George W. Bush in owning the Texas Rangers Baseball Club. Fred later became the Founder and Chairman of Thayer Lodging Group, a private equity firm that acquired over $3 billion of hotel assets and consistently earned top returns for investors. Fred is also the Founder and Chairman of Thayer Capital Partners, a Washington D.C. based corporate buy out firm. In addition to his business career, Fred continuously served his country in a number of capacities including serving as an advisor to four U.S. Presidents: Nixon, Reagan, and George HW Bush and George W Bush. Fred advised President Reagan as a member of the executive committee of the President’s Council on Cost Control, as a member of the President’s Commission on Private Sector Initiatives, and as a member of the President’s Council on Physical Fitness and Sports. He served President Bush as Director of the 1988 Republican Convention and as Director of the 1990 Economic Summit of Industrialized Nations, with the lifetime rank of Ambassador, and as Campaign Manager for President Bush during 1992. Fred also served as National Finance Chairman for the 2008 McCain Presidential Campaign. Fred serves on the Board of the Aspen Institute where he is Chairman of the Finance Committee and member of the Executive Committee, on the Board and Executive Committee of the American-Israel Friendship League and on the Board of the George H.W. Bush Library Foundation. For over half a century Fred has supported West Point with his time and effort. Fred was appointed to the West Point Board of Visitors by President George W. Bush in 2008 and currently serves as the Chairman of the Board of Visitors. He is a major benefactor of West Point and dedicated the Malek Tennis Center at West Point. In addition to his business activities, Fred is the Chairman of Virginia Governor Bob McDonnell's Commission on Government Reform and Restructuring, Chairman of the Republican Governors Association Executive Roundtable, Founder and Chairman of The American Action Network and American Action Forum, and Chairman of the American Friends of the Czech Republic. He also serves on the Board of Directors of CB Richard Ellis and Dupont Fabros Technologies where he is lead director.